Industrial carts are designed to match container size. They are often designed with aisle size and usable area in mind. They are very flexible. Nowhere is the idea of meticulous space consideration more obvious that in mother/daughter carts. 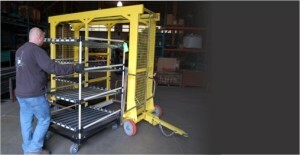 Topper Industrial is very proud of the patented mother/daughter carts and cart systems. A mother/daughter cart is an industrial cart system consisting of one large mother cart and two or more, smaller daughter carts. The daughter carts are designed to fit within the mother cart’s framework. Once inside, the daughter carts are locked into the mother cart. The mother cart and daughter carts are then able to be tugged as one. Daughter carts are often different types of carts. For instance, one mother cart can be designed to carry a static cart as a daughter cart and a rotation cart as a daughter cart. The mother/daughter cart system is a very flexible, effective cart system. Mother/daughter carts can also be referred to as corral carts. This solution also eliminates line side forklift deliveries with mother-daughter cart. Engineered with a diamond pattern for flexibility, the large mother cart frame can accommodate multiple, different daughter carts with different caster arrangements. When locked together, the carts are tugged as one unit, supporting unlimited line side manufacturing deliveries and applications without the need for forklifts. At the assembly line, the operator swaps out a full daughter cart for an empty one, and can work directly out of the carts. Sara Pearson Spector shared in Modern Materials Handling that tuggers and carts have evolved to the point where they can be flexibly engineered to support some, or all, of a facility’s handling needs. Both manned and unmanned tuggers work with powered and non-powered carts in a virtually limitless range of configurations. Their features and flexibility allow these systems to address production complexities previously only handled by fork trucks. In turn, fork trucks can be limited to the perimeter of a facility—for shipping and receiving, and for inventory placement into and out of racks—to increase the safety of personnel in the area. In manufacturing, tugger and cart systems replace one-load-at-a-time deliveries by fork trucks to the production floor by acting as trains, or a linked series of multiple carts, carrying multiple loads in one trip. The carts themselves may be loaded by a fork truck, but a tugger handles the deliveries. Unlike a fork truck, automatic guided vehicle (AGV) style tugs travel along a pre-determined route and at a limited speed, while manned-style driven tug operators have greater visibility because the loads trail behind instead of riding on elevated forks in front of the driver. Delivering smaller lots more frequently in kitted and sequenced cart orders is an engineered response to the complexity of mass customization. Building multiple product lines on the same production floor or offering a selection of options to customize a standard product, require the flexibility that carts can provide. 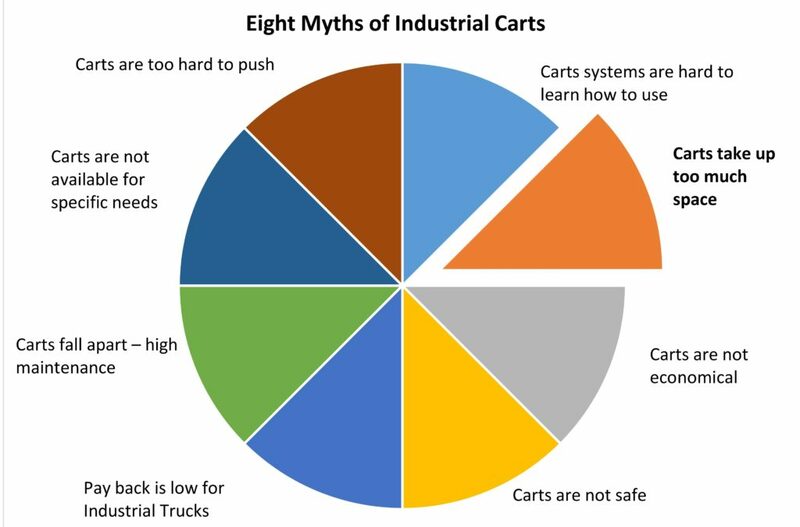 The carts have evolved into specialized tools used in engineered processes to move materials as efficiently as possible. Previous post What is Fork Truck Free Cart Delivery?